GB Village Boy Turkey Escape (alias Turkey Pilgrim Escape) is another point & click escape game developed by GelBold. In this game, a little village boy lost his favorite turkey and his water mill is not working properly. 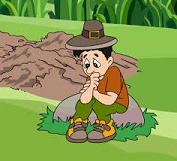 The little boy needs your help to solve the puzzles in the village by finding items and hints in order to retrieve his turkey. Good luck and have fun! This game is buggy as ***. Finished with a key left over. collected some items but then the screen froze (won´t restart) - could someone please tell GB to test their games before publishing them?